He is unstoppable and this is a great story for those who think Superstars have it all easy. Sanju is the biographical story of Bollywood’s most famous superstar Sanjay Dutt. He went through the loss of his mother, father, wife and career. During this tumultuous journey were jail terms, hits and misses at the box office and finally a family that is standing by him today. The hit is the combination of father-son-friend. The very methodical actor Ranbir Kapoor has played the role of Sanjay Dutt and he has transformed his body just to look and convince you that he is Sanjay Dutt. Paresh Rawal plays the role of his father Sunil Dutt, who was a hero of his time and politician. Paresh certainly deserves a National Award for portraying a wonderful human being who was faced with difficult choices in his family life with his wife Nargis Dutt and then his son Sanju. Vicky Kaushal is the new kid on the block and already he is getting noticed. 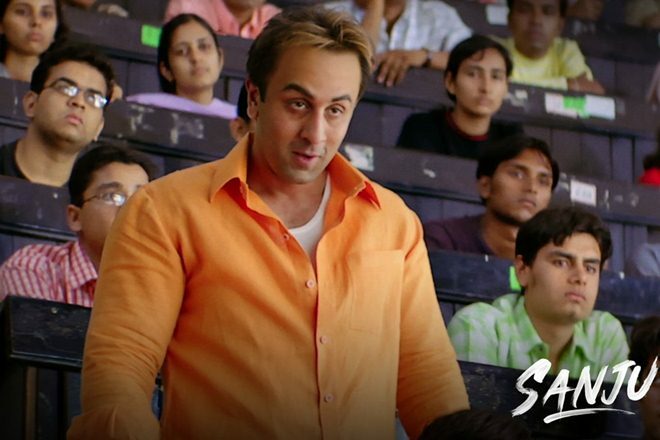 He plays the role of Kamli, a big fan of Nargis who comes into Sanju’s life and changes his life positively. Vicky does the Gujarati accent so well and remains sincere in his portrayal of a best friend who wants the best and fair for his star friend. Rajkumar Hirani has directed the film and he is known to rewrite scripts to perfection, so imagine his work for this incredible biopic. Sanjay Dutt is a free man and is now working as a full time actor while having a beautiful family. Rajkumar Hirani changed Sanju’s career when he cast him as doctor and the film Munnabhai M.B.B.S. was the last time father Sunil and Sanjay worked together. If Rajkumar would not have come in their lives at the time, the final transformation for Sanjay would not have happened. Sanjay’s life included drugs and a short stint with the underworld. My most memorable scene was when he beats up his friend who had gotten him addicted to drugs, it was about time that happened. There are no misses in this film. Only those who are not Sanjay Dutt’s fans will not appreciate this incredible film. If anybody is looking for song and dance, even those are not there, instead there is a new appreciation for music, watch the film and find out for yourself.